It has been a long hiatus since the creation of this site… but with a little [a.k.a: A LOT] of tech support from Ingrid Booz Morejohn– collagraph teacher extraordinaire, and lovely friend– I am back in the website-saddle now. Which leads into the latest news of what I have been working on: COLLAGRAPH prints! The Art Alliance of Central Pennsylvania, offers wonderful classes for art explorers, and artists alike. In January I signed up for Ingrid’s “Collagraph Printing” class– an 8 week course. We learned so much, and due to the enthusiasm of the students Ingrid offered a combo class for the spring session: Intro to Collagraph, as well as a ‘Part II’ for those of us who wanted “more!”. 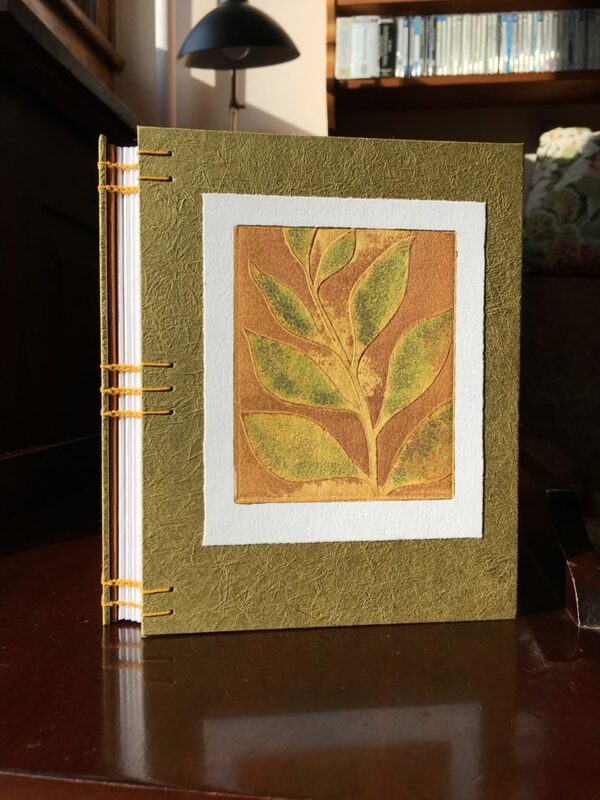 My focus was on wanting to create collagraph prints that could be used in my bookbinding! Yahoo! It was not only possible, but the prints have proven that they blend beautifully with the various papers available from Japan, and Nepal (kyoseishi, and lokta, respectively). The colors are so harmonious, and I think have taken the books to a whole new level of beauty. I have just posted one print here, but there are many more to view on my “Coptic” drop down menu: look under “Books”. There will be plenty more coming, that I can guarantee! !